Mr Bottrill took up the paid post of conductor of the Bognor Town Band. After a while he was not allowed to run both bands so the Bandmastership of the Chichester City Band was handed over to Mr E. D. Shepherd. This did not satisfy all the members of the City Band and there was a bad undercurrent which finally came to a head one Thursday evening resulting in about eight members, including the Secretary, leaving the Band. This was only a temporary setback because at the time there were about twelve beginners with several months experience behind them and with some concentrated practice the Band was soon back to normal. Mr Bottrill acted in the background as musical advisor and a member of the governing body until about 1936. When Bognor Town Band played on the promenade bandstand on several Sunday afternoons and evening during the summer months several members of the City Band were paid 4/- (20p) a programme plus 1/- (5p) bus fare to augment the Bognor Band. The City Band won the Southern Counties 2nd Section Contest and also did well throughout the year. 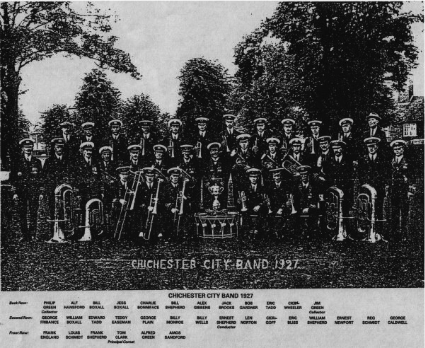 At the following Annual General Meeting Mr Shepherd read out a letter stating that the band had been promoted to the 1st Section.In the minutes of a committee meeting of March 1927 it was proposed and seconded that an appeal for money should be inserted in the Chichester Observer and Chichester Post. It stated that the Band has been in existance for thirty years and done a lot of charitable and entertaining work in and around the City. On 3rd July 1929 a sports day and fete was held at Tangmere Airfield from 2pm – midnight. Air Force lorries came to the bandroom and transported the Band to Tangmere. Unfortunately, whilt unloading, the young flugel player tripped and fell onto his instrument, flattening it. The spare one was quickly sent for and the Band played from 2:00-5:00 pm and 6:15-7:00 pm on the sports field, and in the evening in a larger hanger for dancing. 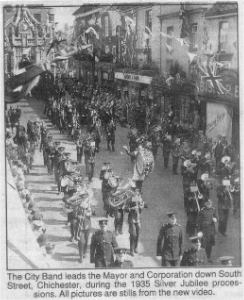 During part of World War II the ranks of the band were slightly depleted but they managed to pull up again and at the end of the war they took part in a victory parade through the city.